Reasons why Thailand should be top of your list as your honeymoon destination. After busy wedding planning, why shouldn't you treat yourselves with a holiday that you will never forget? A honeymoon is typically defined as ‘a period of harmony that follows marriage’. It’s characterised by intimacy, by marital bliss. It will be one of the best moments you spend as a couple, apart from your wedding day, of course. When we think of honeymoons we think of luxury, of paradise. So what location better suits this definition than Thailand? You will not only be warmed by the fond memories of your special wedding day, but also by the sun-kissing rays and the sea breeze, whilst taking in the incredible landscapes. With a perfect blend of breath-taking beaches, tranquil islands, vibrant cities, and picturesque landscapes, Thailand really has something for everyone. You will be spoilt for choice with luxury resorts and things to do as smitten newlyweds. 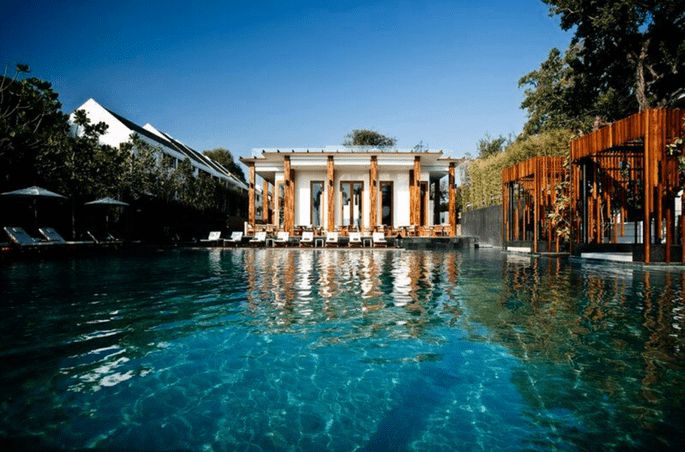 Thailand boasts an array of over 60 five star luxury resorts and tonnes of boutique hotels, so you will no doubt find it easy to pick your honeymoon haven in which you will make your first memories as husband and wife. We recommend Paradise Koh Yao, a boutique resort and spa nestled perfectly between a tropical rainforest and its own private bay. It is located just a speedboat trip away from Phuket, and so it is convenient yet still wonderfully secluded and intimate. Paradise Koh Yao really seems to understand romance. 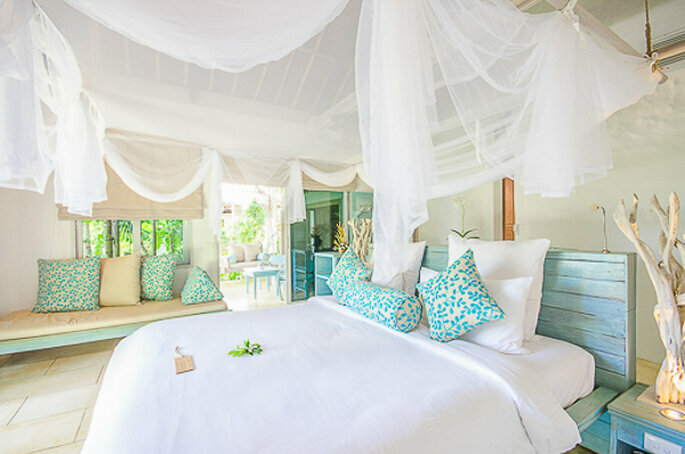 Your honeymoon package will include a private pool or jacuzzi with your honeymoon suite, and exclusive activities such as a candlit dinner for two on the beach, sunset catamaran cruises, and sumptuous massages. Like what you see? 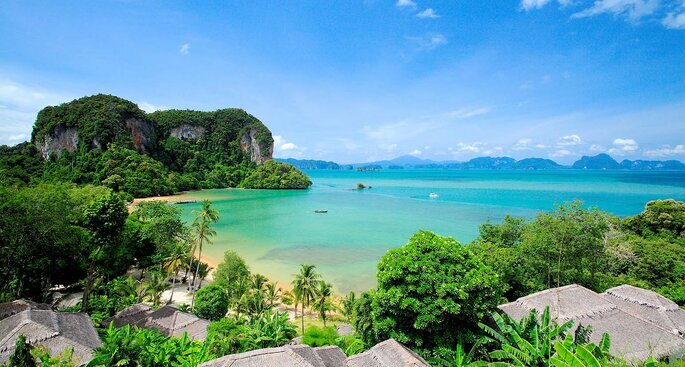 Consider Paradise Koh Yao for your Destination Wedding! There is nothing better than enjoying mouth-watering meals and new, delicious foods when on holiday. In fact, for the real foodies, cuisine can make or break a holiday. In Thailand, you can be assured that you taste a slice of heaven with every meal. 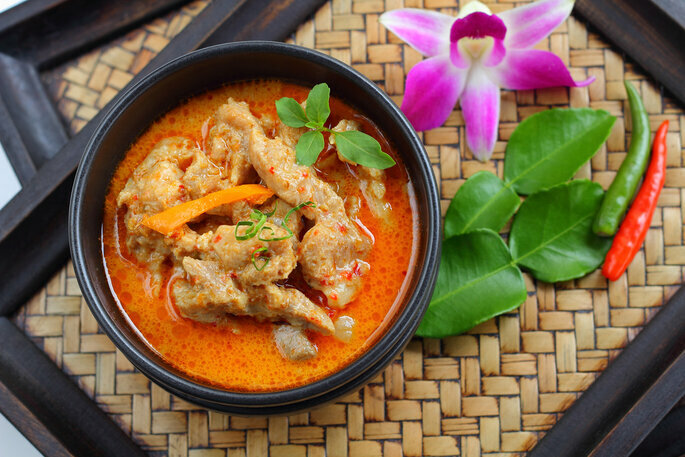 What perhaps makes Thai food taste soooooo good is the fact that Thai chefs use such fresh food: local meats, organically grown fruit and veg, and fresh herbs. On the coast, fish are caught fresh that day, and they do wonders with seafood. If you are a curry fan, you can enjoy it in all colours with a fruity, exotic twist. This, when combined with the Thai passion for spices and infusions, makes for an exciting, dynamic and colourful variety of dishes for you to enjoy. If the stunning, romantic beaches and landscapes aren’t enough for you, then take advantage of the many ancient cities in Thailand, that are bursting with culture and adventure. Visit local markets bustling with handmade crafts and talented vendors. 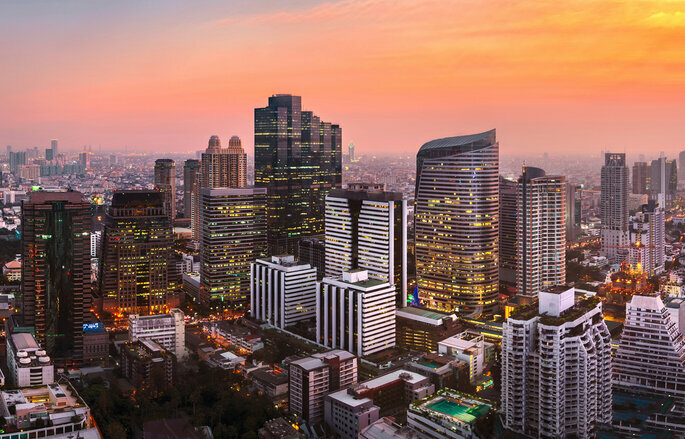 For somemore bustling and modern, pay a visit to Bangkok for rooftop bars, fascinating temples and unbelievable street food culture. This 70 acre resort is situated in Loh Ba Gao Bay on Phi Phi Island. We just love how much they have to offer. Enjoy sea kayaking, island boat tours, fishing, thai cooking classes… or just sit back, relax and take in the beautiful surroundings of Phi Phi. For a secluded hideaway on one of Thaland’s most spectacular tropical islands, Bo Phut resort and Spa is perfect. Experience unparalleled fine dining and a world class spa, for honeymoon memories that you will cherish forever. The Cape Nidhra Hotel, is in the heart of picturesque seaside town of Hua Hin, directly on the beautiful Hua Hin Beach. Here, there’s no danger of running out of things to do. The hotel offers easy access to the town’s charming street nightlife, as well as access to it’s fitness centre, spa and beautiful beaches. Plus just look at the Rocks restaurant overlooking the huge saltwater pool… it’s stunning. So what are you waiting for? There are hundreds of idyllic places in Thailand ready for you to enjoy as part of that one, blissful holiday that you will most certainly never forget. Enjoy! 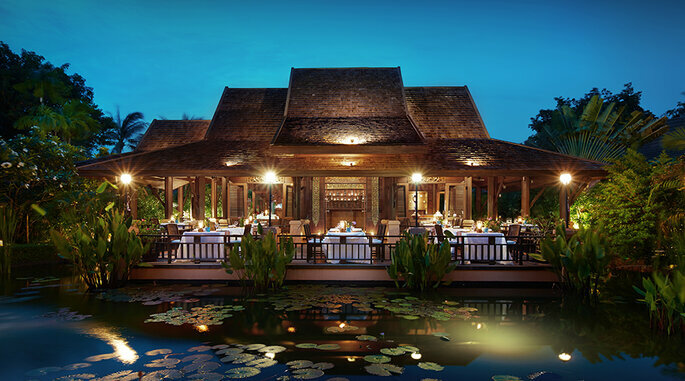 For more top Thailand honeymoon hotels: The perfect destination for a romantic getaway!